Each year the Noah girls play a secret game-- Crushed. The rules are simple. 1. Use wisdom to pick your target. The boy can't be too weak or too strong-willed. 2. Blow the enchanted dust into your target's face to enchant (Crush) him. 3. Give verbal commands and assign them tasks to perform throughout the year. The more tasks completed, the stronger the witch's power grows. 4. At the end of the year, the witch with the most power wins cold, hard cash. 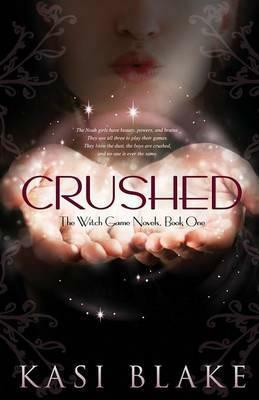 As if being a witch in high school isn't complicated enough, Kristen picks the wrong boy to Crush. Zach is tall, handsome, and a little scary. Her Crush spell isn't working on him like it has with the others. In fact, he is behaving the opposite of every other boy she's Crushed, hating her instead of adoring her. Something is definitely wrong. After someone attempts to kill her, Kristen realizes there is more at risk than a few hundred dollars. She may be betting with her life. If you ask Kasi Blake how old she was when she started writing, she will probably say twelve. That's when she wrote her first short story. But it started long before then. Her first characters were invisible friends she played with as a child. In the third grade she wrote a one-page story about a mummy for an assignment, and the teacher read it to the class. Even though she was embarrassed, the other kids laughed in all the right places, and she realized she could affect other people through her writing. She loves to get lost in emotional stories, crying and laughing with the characters, so she thinks it's the most amazing thing in the world to be able to do this for other people. Originally from California, she resides in the Midwest on a farm with cows, chickens, ducks, a dog, and two cats.